36 | Another cool feature is the interior cabinetry that extends outward to serve as a storage shed for pool and garden supplies. 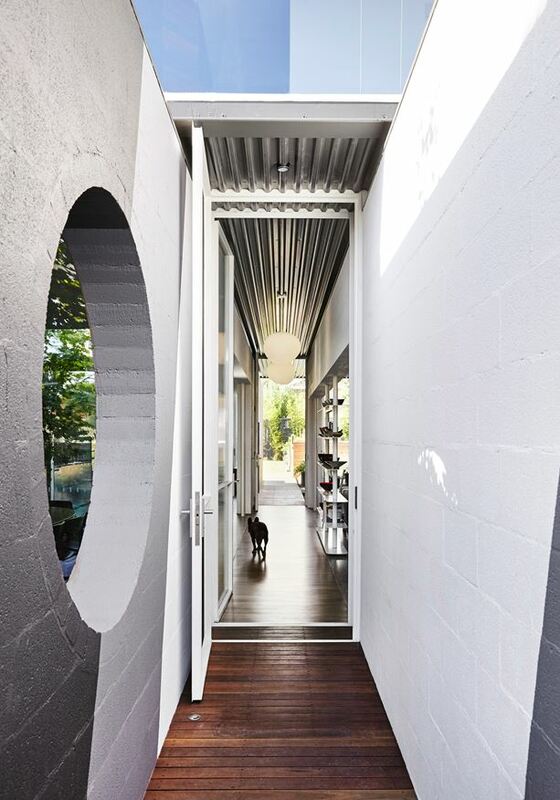 34 | Tall doors allow access to the roof patio. 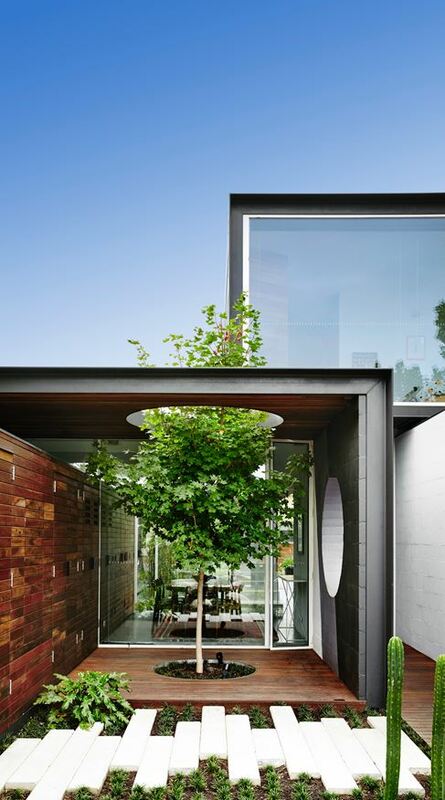 The tree growing up through the lower patio contributes to the incredibly unique aesthetic. 37 | The architects went to great lengths to secure local trades, materials, and fittings for the construction of the home wherever possible. 31 | Even the pool utilizes a spacious yet space-conscious design, wrapping around the home in the shape of an L.
With the intent to create a home that fosters interaction not only between family members but also with the surrounding environment and community, Austin Maynard Architects drafted up a creative three-volume structure and outfitted it with an ingenious interior layout to match. 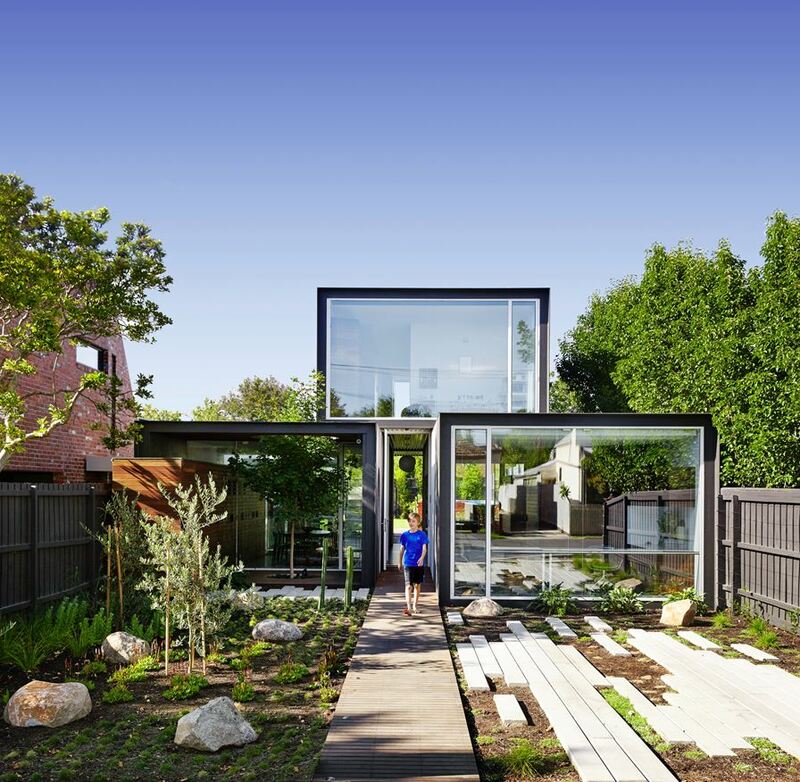 It’s only half the size of its neighbors – an attempt to avoid one of the causes of urban sprawl in Melbourne, where flat ground encourages builders to create larger homes than other settings can ordinarily accommodate. The result is a relatively compact open interior layout that maintains a strong communication with its gardens and courtyards. 2 | Interesting architectural features like this partially-enclosed patio serve to break down the boundaries between indoors and out. 33 | Circular windows on the sides of the home are one of many energy-saving measures. 3 | While it looks like an exposed passage from a head-on angle, the hallway is actually open to the social areas on either side. 38 | Doesn’t it look beautiful all lit up at night? Some of this power comes from the solar panels that cover the upper roof. 8 | No, this isn’t a different angle. 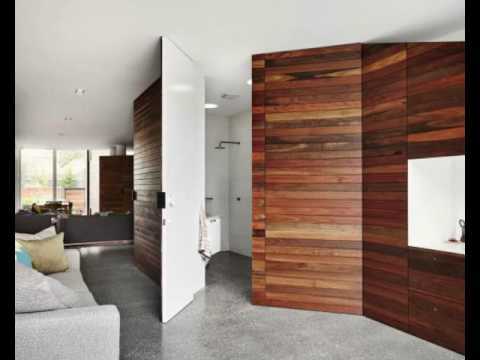 A swinging wall provides privacy when needed. It completely changes the space! 35 | The roof actually directs rainwater into an underground storage tank used to flush the toilets and water the garden. 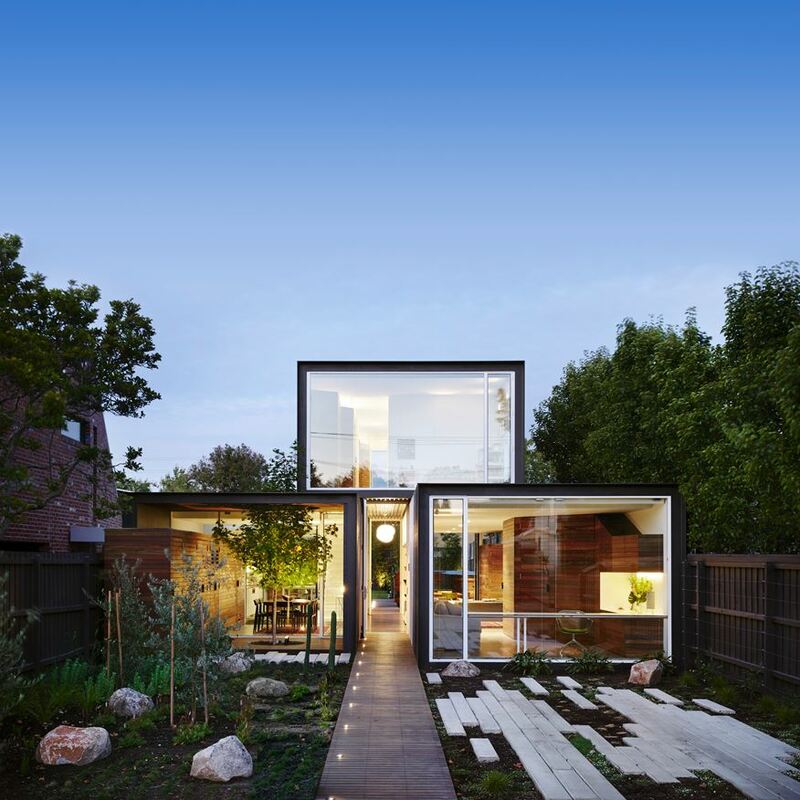 When the architects set out to combat the downsides of urban sprawl, they implemented features like this to further reduce the home’s impact on the environment. 29 | The adult bedroom is far more subdued than the child’s room in terms of decor, but still features fun (yet subtle) polka dots on the blanket. 27 | Another window near the ceiling brings even more light into the room. Notice the sliding door – a nice space saver. 32 | Wide stepping stones provide a convenient walking path across the yard but also continue the trajectory of the building shape. 6 | The wooden wall houses hidden rooms on either side, with a depression making space for the media center. 23 | Public rooms occupy the first floor, with private spaces above. 28 | Like the main level, the upper hallway bisects the volume from end to end for a clear view through the middle. 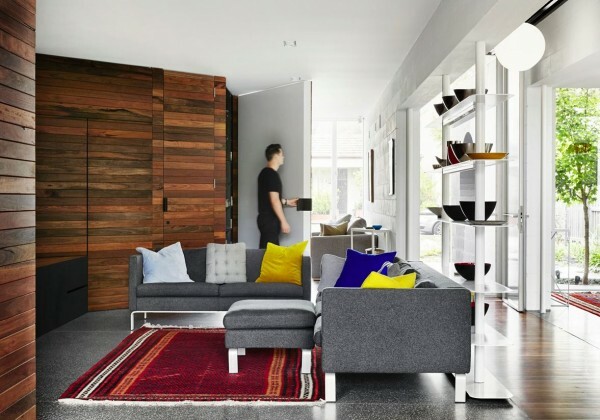 4 | Decorated in bold primary colors, the living room features a warm and exciting atmosphere. 26 | Anyone bathing in the gorgeous enclosed tub can enjoy a view of the sky from the distinctive circular window. 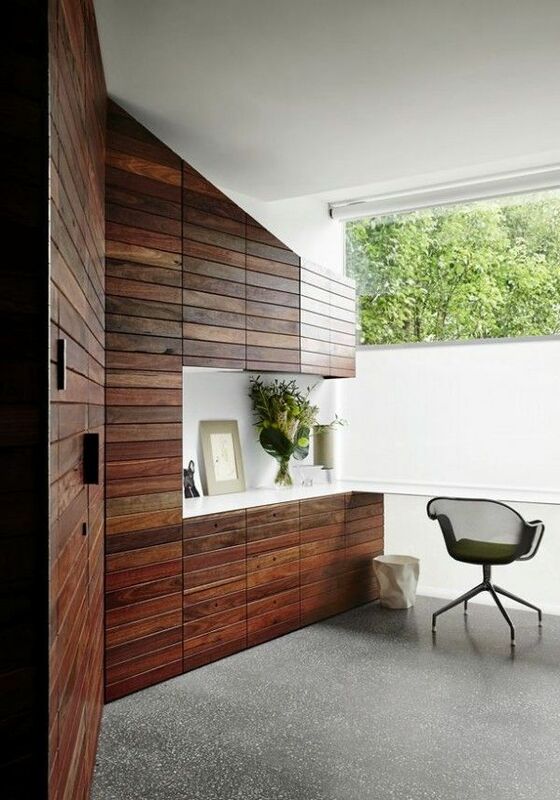 11 | Optional privacy is especially important since this space houses the office. Shades that lift from the bottom up (used throughout the house) provide privacy from the neighbors without darkening the room. 18 | Minimalistic and attractive, the bright white kitchen uses angled surfaces as a play on the abundant light that filters through the atrium courtyard to the left. 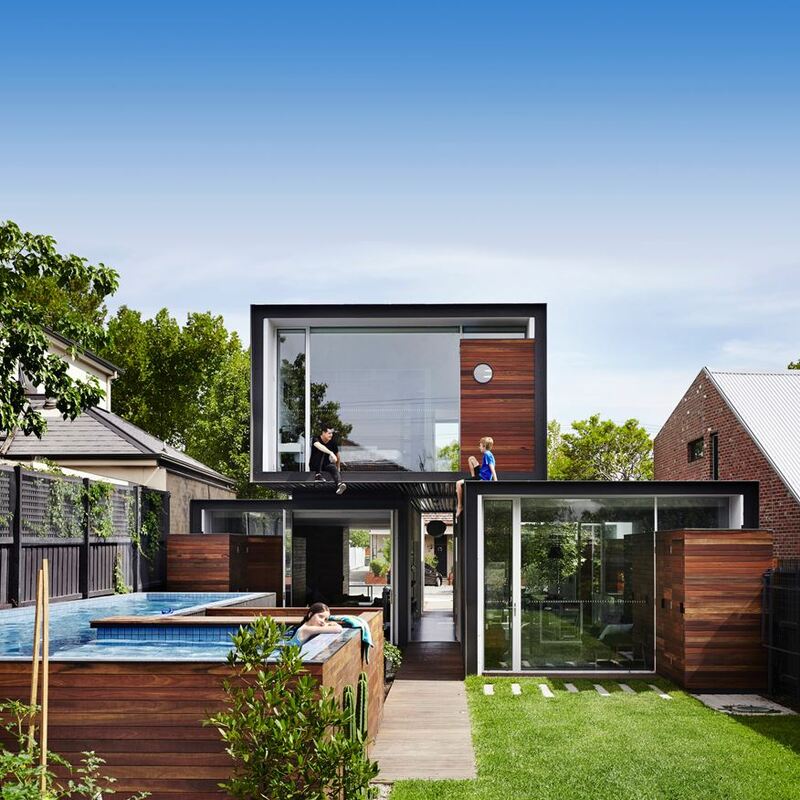 30 | A wonderful view of the pool allows parents to keep an eye on the children as they play outdoors with friends. 10 | The doors would blend right into the background if it weren’t for the visible hinges and the distinction created where the horizontal panels don’t line up. 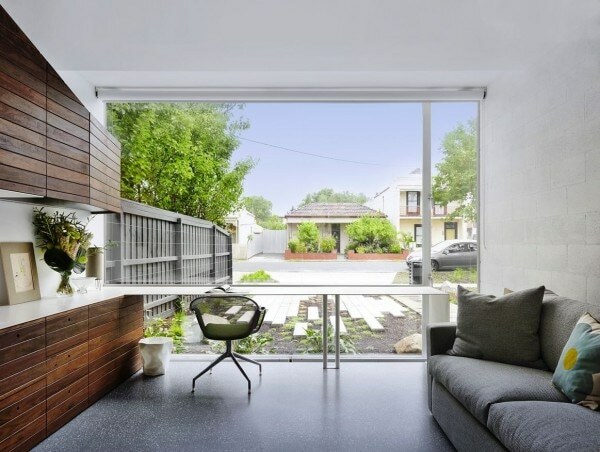 15 | A smaller sitting room faces toward the backyard, its privacy guarded by a tall surrounding fence. 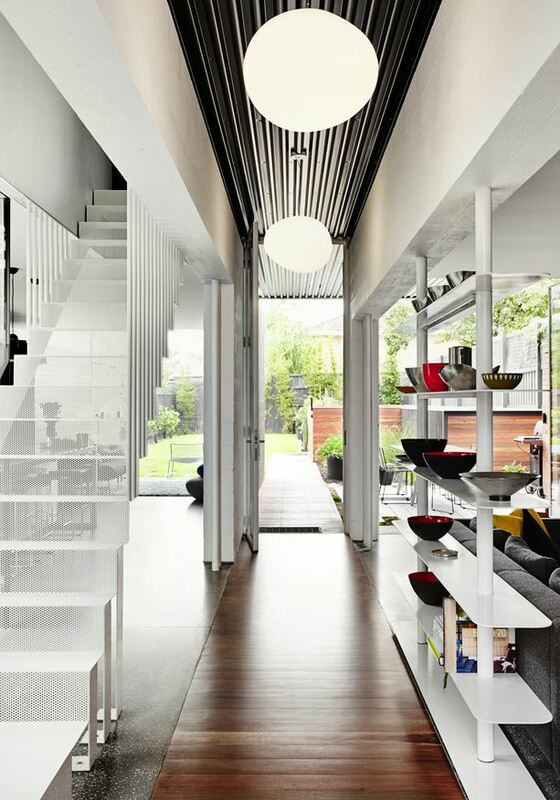 1 | A hallway bisects the two lower volumes and continues in a straight line through the home, its ceiling formed by the upper volume. 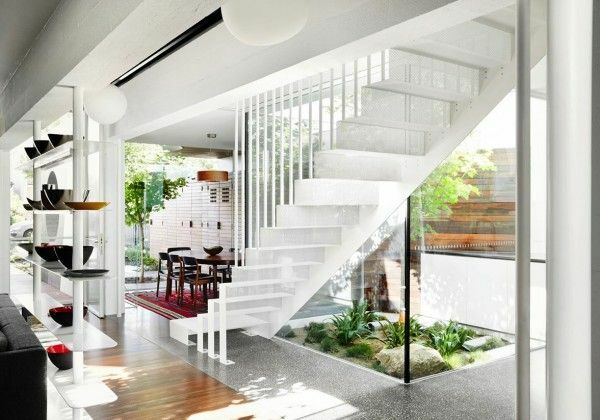 20 | Mesh stairs preserve the view of the outdoors, with support beams continuing the implied boundary started by the open shelves in the living room. 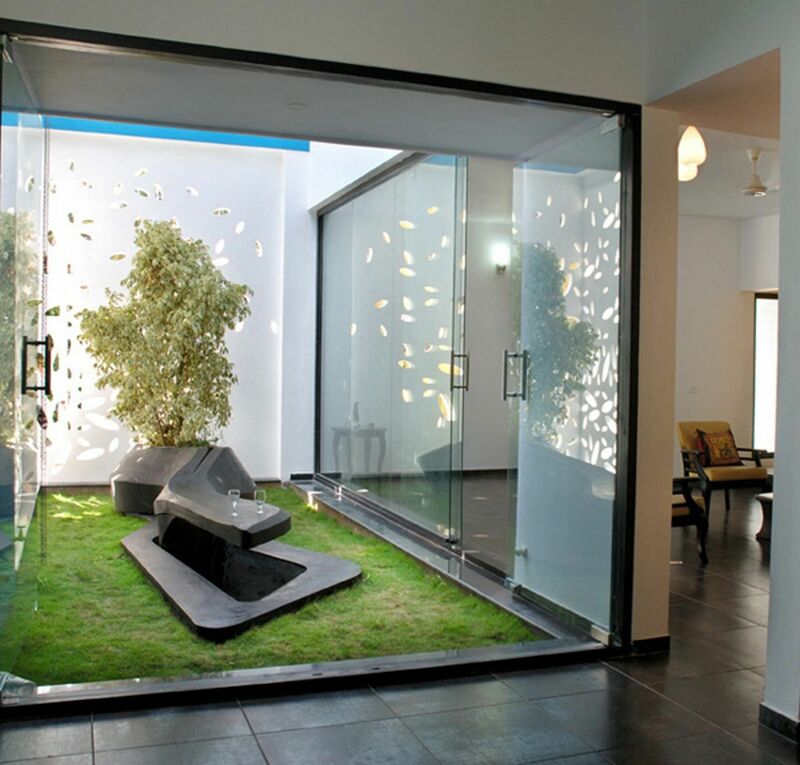 9 | The bathroom remains minimalistic, sparing unnecessary details like a mirror frame in favor of a cleaner aesthetic. It does boast some innovative features such as the placement of the lower cabinet handles – they’re located on top of the doors so residents won’t have to stoop down to open them. 21 | On the other side of the atrium, the third and most formal dining room embraces dark woods and bright colors. 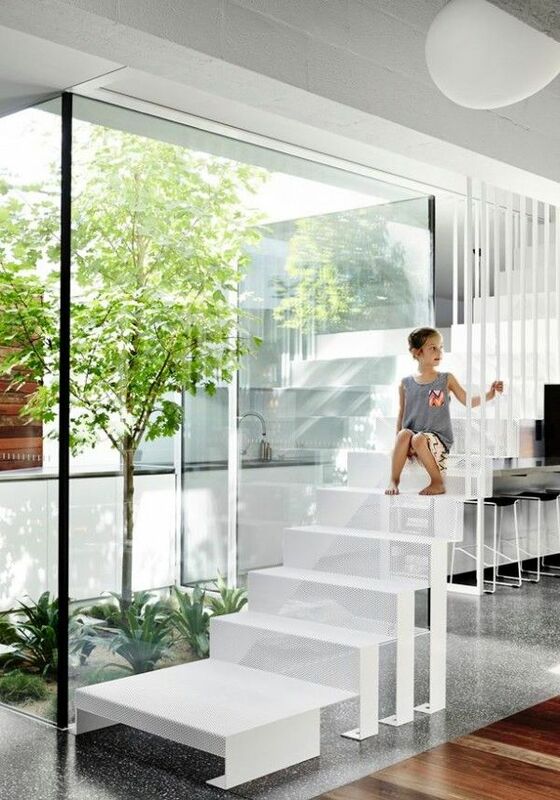 22 | Here’s a young child enjoying the incredible view of the home and atrium from the stairs. 40 | Here’s the thought process that led to such an innovative layout. 14 | Back in the hallway, clever divider strategies help separate the kitchen to the left and the living room to the right. 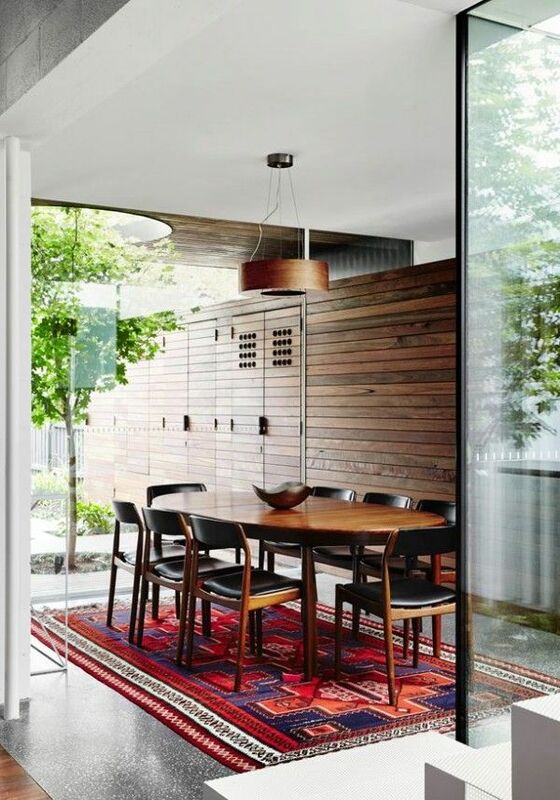 7 | Floor-to-ceiling doors maintain a minimalistic aesthetic. 25 | Let’s start the bedroom tour with a little appreciation for this super-cute room! Modular shelves, a string of paper lanterns, a playful polka dot bedspread, and a stimulating view of the neighborhood are certainly enviable features any kid would envy. Parents can shield the room from the street using the bottom-up shades. 19 | Check out the neat storage in the side of the kitchen island! Everybody needs a place to store cookbooks and morning reading. 24 | It’s a completely different atmosphere on the upper level. Carpet warms the feet on mild mornings. 16 | Looking out onto the rear patio, a small dining area offers yet another place for guests and family to gather and socialize. 17 | Here’s a second dining room right off the media area. All told, there are a total of three dining tables in this house! Not bad for a home half the size of its neighbors. 13 | A mesh IUTA chair by Antonio Citterio pairs well with the super slim-desk, their sense of transparency preserving the view into the garden. 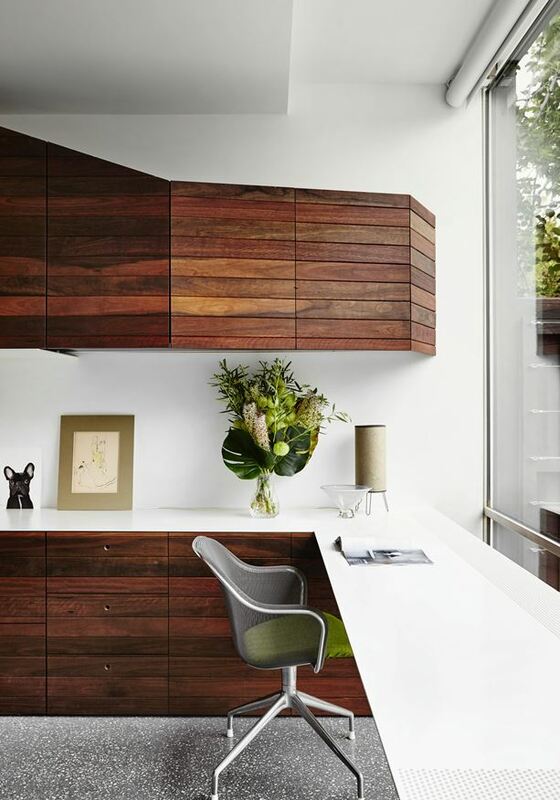 12 | The desk itself wraps around into a sideboard with plenty of storage, and cabinets above. 5 | It gains a sense of division with a simple open shelving unit, displaying a gorgeous collection of decorative ceramics.